The Thunder have made it tough for themselves to qualify for the knockouts. Melbourne Renegades have become the second team to qualify for the knockouts of the ongoing Big Bash League (BBL) after registering their eighth win of the season. The trend of low scores continued in the BBL this as the hosts defended 140 at the Docklands Stadium in Melbourne. The Thunders were left wanting in demanding conditions and have done no good to their chances of playing the semis with this loss. After opting to bat first, Melbourne Renegades never looked like getting to a competitive total. They lost wickets at the regular intervals only for Mohammad Nabi to hold the innings together. At 90/7 in the 16th over, even he was sent back by the clinical bowlers of the Thunder. But then came the unexpected blitz of the day. Cameron Boyce came to bat at nine and took the attack to the opposition. He slammed 51 runs off just 22 balls with four fours and five sixes which took the Renegades also by surprise and the opposition was shocked. Renegades added 50 runs in last 27 balls and posted a competitive total of 140 runs after 20 overs. Sydney Thunder never looked like chasing the total down. The clinical bowling from Kane Richardson at the start of the innings and was duly backed up by Chris Tremain. 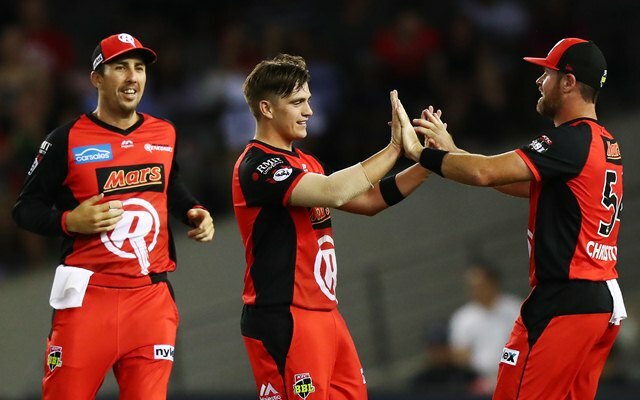 The Renegades bowling attack is high on confidence after bowling out the Scorchers for 78 in the previous game and the same was visible today. The good work done by the new ball bowlers was taken over by the spinners and Boyce was once again in the limelight. At 45/4 in the ninth over, the game looked done and dusted for the Thunder. But Baxter Holt batted well to score 37 off just 28 balls and Callum Ferguson kept the team in the hunt. But both of them were dismissed in quick succession to end the hopes and the visitors were eventually bundled out for 113 runs falling well short of the target. Two bad overs at the death cost the Thunder big time. Reckon Cameron Boyce might be playing himself into Australian T20 calculations once again, he's such a dynamic cricketer and such an important weapon for @RenegadesBBL. 132 runs at a strike rate of 160, and 11 wickets at an economy of 6.12 in what has been an incredible @BBL. Cameron Boyce becomes the first player batting no.8 or below to hit a fifty in the Big Bash League. Great innings Cameron Boyce @CaJBoyce 51no of 22. Smokin! !